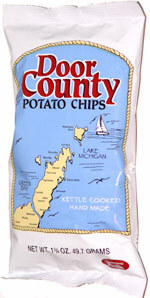 Taste test: These chips are similar to Cape Cod potato chips in shape, consistenty and taste. They're fairly thick, with a good kettle-cooked crunch and a good potato taste. The similarities to Cape Cod chips don't end with the chips. Cape Cod chips have an illustration of a lighthouse on the front of the bag, and a map of Hyannis along Nantucket Sound on the back. These have a drawing of a lighthouse on the back, and a map of Door County along Green Bay and Lake Michigan on the front. Smell test: Good kettle-cooked potato chips smell, a lot like Cape Cod chips. 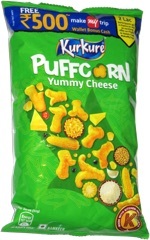 This snack was discovered by Dad in Milwaukee. Review published .